Manuscript Document Signed “John S. Kennedy” 1pp. 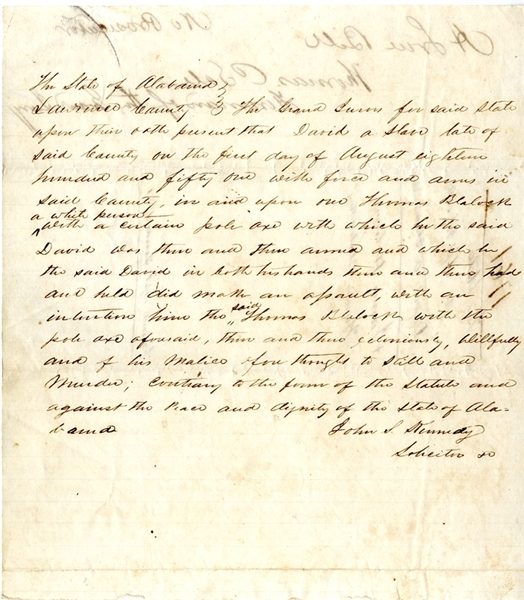 quarto, September Term 1851, Lawrence County, Alabama, and reads in part: “...The Grand Jurors ...present that Davis a slave late of said county on the first day of August eighteen hundred and fifty one with force and arms in said county, in an upon one Thomas Blalock a white person with a certain pole axe with which he the said David was then and there armed and which he the said David with both his hands then and there had and held did make an assault with an intention...there and then feloniously, willfully and of his malice afore thought to kill and murder...” Fine condition. The 1850 census shows Thomas J. Blalock of Lawrence County, Alabama, holding thirteen slaves.